Digital artist Shamus Clisset works with 3-D modeling and rendering programs to produce scenes that are at once seemingly realistic and completely improbable. His current work focuses around a figure called FakeShamus, a malleable figure Clisset has dubbed his "digital golem." Clisset says that in his earlier work, FakeShamus was a figure within an environment, who interacted with and was influenced by other objects within his universe, but was still separate from them. As Clisset's work has evolved, so has his digital counterpart. Instead of working on placing FakeShamus within a scene, Clisset now works on manipulating the very surface of FakeShamus himself, even using materials and objects from other scenes—FakeShamus no longer exists within a universe; he is the universe. Clisset's technique of 3-D modeling allows him to make such drastic changes to the space he works within, but he also allows the space and the figure that inhabits and embodies it to have a mind of his own. 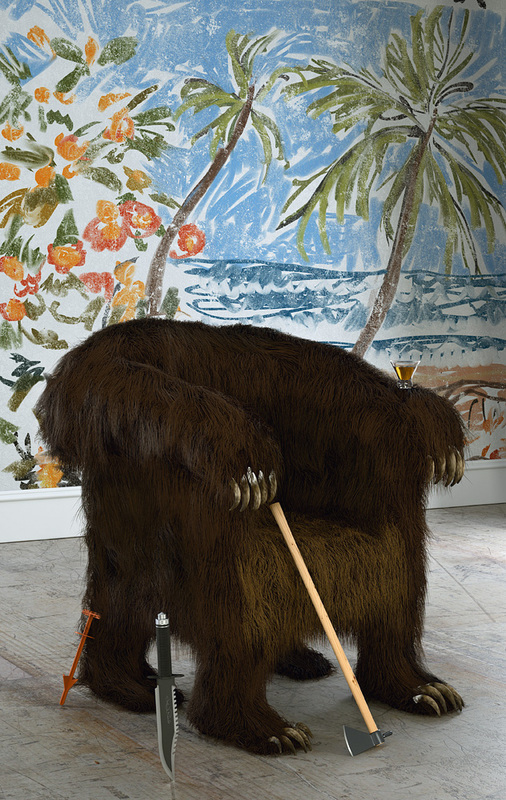 Clisset had a show at Postmasters Gallery, New York, in September 2014, a gallery known for its history of presenting art that challenges the work's traditional relationship to the gallery--something Clisset himself is passionate about. Says Clisset, after years of studio visits in which people were always too baffled by the technology to be able to talk about the art, showing at net-savvy Postmasters felt "like I was home." To start, can you tell me about your process? I work using two programs, Blender and ZBrush to do the 3-D modeling before sending them to the rendering program. The 3-D modeling software looks very different from the finished product, because you just model the shapes and then add in commands for material and texture, so it's important to be able to see what you're doing in your mind. In the program, I create detailed 3-D scenes, even detailing the landscapes, and then after rendering, I take a 2-D shot. So it's kind of like taking a photograph? It's similar. You choose the angle, the composition, the zoom, but it's also different. Since I created these landscapes, I know the ins and outs of the scene a little more. Would you say that you first come up with an idea and then sit down at your computer, or just sit at your computer and start from there? Do you think differently if you're actually at your computer? It happens both ways. I've definitely had images that come perfectly into focus in my head and then I just know I have to make it this way and I fill in gaps and it's done. But most of them just happen because I have an idea to make a certain object and everything else in the image is just something that came while I was working. My newest work is different--it's really about having a very vague idea of the space and the object or the figure and then working spontaneously, much more interactively sculpting or painting the image. It's about keeping yourself surprised. Speaking of process, a lot of times when people look at your work, they think it was either sculpted then photographed, or you at least used some photographic elements, and then there's that process of realization that what you've created completely improbable. Would you say this sort of cognitive dissonance or time lapse between the viewer's first perception of your work and their eventual understanding of it is something intrinsic to your work? I think it's inherent to it. It's not like I want to trick people then have the gimmick revealed or something like that. 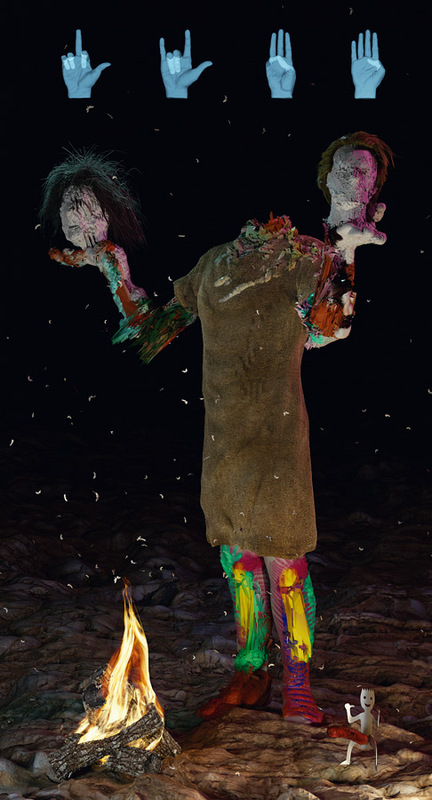 I think it's more like, if you look at this salt shaker and you go home and think of it later, you can have this very real, detailed image of it in your head, but it's not physically in front of you. And I want my work to have that quality instead of a photographic quality. I want it to be like you're projecting this mental space into a format other people can see. Ultimately what would be amazing is if they develop the technology to let us communicate telepathically and artists will be able to just beam their images into the heads of the audience, but this is the closest we can get to expressing that. Ye Signs of Power, 2015, c-print. Image courtesy of the artist. It's really interesting that you compare something people think of as very "fake," (particularity because of your use of that word in "FakeShamus") - this 3-D imaging space, to something people think of as maybe the most real - this kind of mental space. Do you think that for you, because of your experience with the medium, there's less of a difference between the physical and the digital, especially as being the "real" and the "fake"? Yeah, that's probably true. When I'm working, I'm not thinking of that 3-D space as any different from physical space. I'm in there, and I'm inhabiting it, just as much as we're sitting at this table. Of course I'm conscious of it on a certain level, just because you know what technical things you have to do to achieve something, but once you really get into that mode, it's a very fluid back-and-forth between the realness and the fakeness of it. The word "fake" in "FakeShamus" is really put in there intentionally to kind of play around with that idea. In some ways, it's a clue for people to acknowledge what they're looking at isn't real, in a very tongue-in-cheek kind of way. But at the same time, fake, to me, is just as real as reality, and in some ways it's even more real, much more than something like early Photoshop work when people would photograph something and turn it into something that really never existed, but try to convince people it did exist. There's a truth to making something and knowing that it's fake and telling your audience that it's fake. I want it to be on its own terms, something different from reality that is its own reality. I think the kinds of characteristics that these images have are pretty unique. It's just as much a leap from photography to 3-D rendering as it was from painting to photography--they have their own characteristics even though there were similarities at first. You know, a lot of early photographers used the camera to make things that looked like paintings, and I think CG is the same way, a lot of people started out trying to emulate photography; because you could make something look that real, the focus was on making everything look very real. But there's an evolutionary process that happens there, in art especially, where technology just has to come into its own, and I think 3-D is starting to do that. 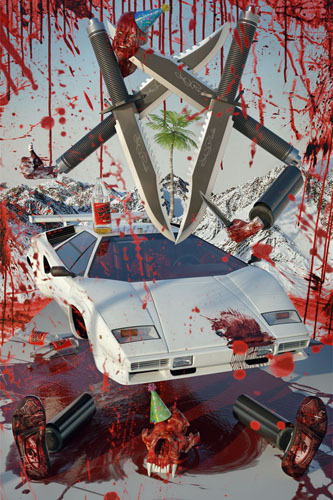 FakeShamus Conjuring the Countach, 2010, c-print. Image courtesy of the artist's website. Would you say, in terms of that ability to create things that you come up with, without being tied down to the physical, that 3-D rendering is a lot less limiting than other media? Oh, definitely. FakeShamus Conjuring the Countach is the perfect example. My whole artistic history is due to that car. When I was 8, I saw pictures of that car and became totally obsessed with it. I think it was the most amazing, futuristic, incredible looking object I had ever seen. And I just started to draw it obsessively. So that idea of being able to make anything, I realized that, starting to work in 3-D, that I can have my own Lamborghini if I want. I can make it, not necessarily exactly as it is in real life, but instead as my idea of it. So a lot of my work starts from that, taking these things I obsessed about and being able to own them, recreate and make my own versions of them, and then from there being able to manipulate them and put them in any scenario I want. It's totally unlimited. You can create the entire world if you put enough work into it. I've often been asked if I ever want to print these images into sculptures, but it's just not something I've ever seriously considered. For me, it's really about that distinction, and once you print a virtual model into a piece of resin, it's just a hunk of material again, just an object in the real world again, and for me, it's much more about working in that other space. I think there's a little distinction between artists who use technology to allow them to fabricate myself and artists like myself. For me, it's so built into the concept of what I'm doing, that I treat it differently. It's not just a tool to make something else; it is the thing itself. So can you tell me a little more about FakeShamus and this term "digital golem"? When I started using more 3-D software, it dawned on me that I wanted to put myself into that space, and since I couldn't actually, I realized I could create something that was a counterpart to myself. And one of the things I came across at the time was this myth of the Golem, this lump of clay that some magical guy brings to life, and it does his bidding, but there's also always a dark side to it. And once I had built this character, it was clear that it was the perfect analogue. I liked the idea that I'd created it and let it loose, leaving it open as if it's got a mind of its own, kind of a creation/destruction thing, where I create the world, and he comes through and wrecks it all. That's where a lot of the humor comes from, from the dark side. I wanted to ask about the way that you display your work. How do you think displaying prints in galleries affects the viewing of your work? The scale has a lot to do with it; it's the ability to create a work that's both that large and can really confront you in the gallery, and has that level of detail, which is really unique to rendering. With cameras, even if they're getting closer, you blow up a photo and there's still a limited amount of information. With rendering, it's unlimited. I could make one of my pictures 100 ft tall and it would still be as sharp. But, and this isn't to knock internet art at all, but I've never had an experience with an online piece that had that kick-you-in-the-gut feeling. There's something about going to a show and being in that gallery space. Also, the way I display images is as flat to the wall as possible, with hardly any depth, which almost makes the pieces seem like they're windows into a space on the other side. So then the other projects you do, such as your Tumblr or the .gifs you make, are those separate? That's more for sharing works in progress. I've met a lot of good people through those platforms, that's the good part, the connectivity of it. Tumblr is especially inspiring because just anything goes on there, you can come across some of the craziest imagery. When I started making digital art I felt like so many people were making this sort of gallery art, stuff that made sense within this academic sense of what art is supposed to look like. And meanwhile, on someone's Tumblr, it's just so far beyond those boundaries. Things are judged not on how they fit into some system but just on how, you know, crazy they are. When I started putting this most recent series together, it was a definite motivator for me to make some crazy imagery instead of playing it safe. Do you think that ties into the use of humor in your work? Your work is immediately enjoyable; it's this unique kind of work that I think my dad would enjoy and think is funny, but also that my friends at art school would enjoy. Humor is super important to me in general, and I feel like it's just something that comes through. It ties into what I said about not wanting to make work that's gallery safe. There are some very funny artists, but most of the time it's seen as, you know, you have to be serious and you have to have a very serious concept, and I think that's probably changing with younger generations. That kind of sanctity is decreasing. 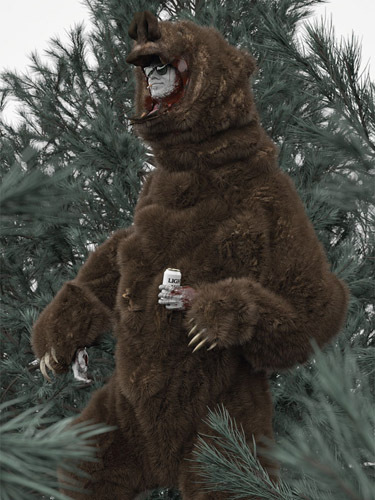 FakeShamus, Manifest Destinaut (Grizzly-Suit), 2010, c-print. Photo courtesy of the artist's website. So you have a work called The Beeramid, and your Tumblr is called Enter the Beeramid, so I have to ask: why beer? There's a cultural thing about beer in cans, it's kind of lowbrow but very American. You know, crack open a cold Budweiser, tap the Rockies Coors Light...But then I also like the idea that an empty beer can is called an "empty," and that stood in nicely for me as a symbol for the fake, the idea that all these objects I'm building have no actual inside, that everything you see is just a surface. It's funny--it is totally a cultural signifier, and it's not that I want to be making fun of that because I actually genuinely like beer in cans. And I think no matter what beer you drink, there's just no denying that these beers are representative of America. And I think that's the bigger picture of why I'm drawn to it, there's a lot of imagery, a lot of the Southwest, Wild West imagery I use has to do with the idea of America having been this ultimate frontier land, this place people could adventure, and now what do we have as the consequences of that? Super-megamart places that sell huge cases of beer and there's no adventure anymore. And what happens to people in a country like that? We've totally lost track of that history--we're aware of it, but we don't live it in any real way and that's all really interesting to me, too. There's a lot of contradictions in America and our culture in regard to that and I think my pictures display that too. So then, mandatory art question: are there any artists who have really influenced you or do you get your inspiration from other sources? Definitely early on, I was influenced by a lot of painters, not by their technique but by their philosophy. A lot of it has to do with humor. Sigmar Polke is probably my favorite artist ever, because there's just such an irreverence to what he does. He's doing this very serious painting practice, and through his experiments creates this incredible, beautiful paintings, but at the same time he's, you know, doing a picture of a palm tree and a flamingo, and he's throwing all of painting out while he's being very serious about that, and I love that. Martin Kippenberger and Albert Oehlen, Mike Kelley, too, have a lot of that humor and irreverence, all that seriousness and a total joke at the same time residing in the same space. But as far as my actual pictures, I'm more inspired just by things that are around. A lot of the figurative stuff, I'm fascinated by very early photography of the Noble Savage, you look through photo archives of these posed photographs of members of various Native American tribes and frontiersmen, and I'm really interested in that capturing of the image of that culture in a way that's actually totally foreign to its nature. What do you think is the future of 3-D art as it gets more and more accepted as an artistic medium? I don't know, I'm not sure I can predict where it's going to go. I think probably it's going to become more interactive, become more real time, more virtual reality style environments. People have already started doing it really well, like there was the Jeremy Couillard exhibition at Louis B James recently, and he called it "Out of Body Experience" and that connects a lot to what I'm thinking of, taking people on some kind of trip. But I think art's going to get more and more inclusive of different formats, like video games. You don't want to pigeonhole yourself, because some genius kid is gonna come along and do some insane multimedia piece incorporating everything, but you just have no idea what's going to happen. I think that's the question then: What is the space between the screen and the gallery? What gives you that kick in the gut feeling that you want from the gallery with the interaction and control of the internet? It's really interesting how the internet expands and takes on infinite qualities but our interface with it is just this little thing, we just get this little portal to it, and yeah, it runs a little bit counter to what I've always looked for in an art experience, but there has to be somewhere where that all meets and it takes you out of that little portal and into that infinite space.